Reverie has a large range of carbon fibre rear wings that range from simple low drag wings to dual element high down force wings. We are able to produce curved and straight carbon fibre wings as either single or dual element. 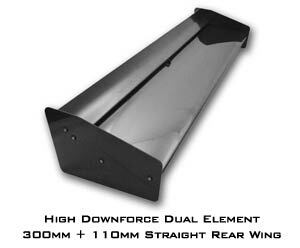 We also have a range of lotus and TVR compatible wings. We are able to produce custom end plates if you do not like the standard plates that come with the wing. Our carbon fibre wings are autoclaved for the best finish and longevity. Lacquering is available to further increase the lifespan of the rear wing. Some examples of fitted carbon fibre rear wings are available in the gallery. If you have any questions about our carbon fibre wings please do not hesitate to contact us.